The use of the CRISPR/Cas9 system in mammalian cells has emerged as a very convenient way to modify the cell genome at a specific locus. It involves transient transfection into mammalian cells of either (a) one or several plasmids coding for Cas9, the specific gRNA and eventually the sequence to be inserted, or (b) a mix of one or two plasmids and an RNA molecule (the gRNA). The association of Clustered Regulatory Interspaced Short Palindromic Repeats (CRISPR) and CRISPR-associated (Cas) nucleases is an innovative technology to generate gene knock-outs or to introduce defined sequence modifications or deletions in the genome. CRISPR/Cas9 system is a prokaryotic immune mechanism that confers resistance to foreign genetic elements and consists of a DNA nuclease called Cas9 and a non-coding guide RNA (gRNA). The gRNA guides the Cas9 nuclease to a specific complementary genomic locus where it induces a double strand break. When using CRISPR/Cas9 system, transfection is a key and often limiting step to ensure successful genome editing. There are three main systems to transfect guide RNA and express Cas9 protein which are DNA, RNA or RNP (gRNA + Cas9 protein) approaches. Each system has their own pros and cons in terms of easiness of use, genome editing efficiency and off-targeting effects. Delivery of both gRNA and Cas9 as plasmid DNA leads to high gene editing in easy to transfect cell lines, but is less adapted for difficult to transfect primary cells and cancer cell line. Another parameter to take into account is the expression duration of the Cas9 protein in cells, which can lead to off-target nuclease activity. DNA-free delivery systems in which the Cas9 protein is delivered as mRNA or even more so as a protein can improve specificity of Cas9 endonuclease activity, thereby limiting off-target effects. 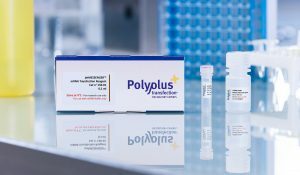 Our jetPRIME® reagent is ideal for plasmid DNA-based genome editing in vitro as it requires low DNA amount and is suitable for multiple plasmid co-transfection while maintaining excellent cell viability. Indeed, several groups already successfully used jetPRIME®-mediated transfection of the CRISPR/Cas9 system (Davidson et al., (2014) Genes Dev 28(4):342-56; Moore et al., (2014) Nucleic Acids Res 43, 1297-303; Shi, J., et al. (2014), Nature 514, 187-9). Our jetMESSENGER® reagent is ideal for efficient co-delivery of the Cas9 mRNA and the guide RNA molecule. With Cas9 mRNA and guide RNA, faster gene editing can be achieved, as entry into the nucleus and ensuing transcription of the Cas9 protein is no longer necessary. By switching to transfection of the Cas9 mRNA instead of plasmid DNA, the vast majority of primary cells and cell lines can now be used in genome editing studies. Our jetCRISPR™ reagent is our latest innovative reagent designed to directly deliver Cas9 as protein along with the guide RNA, also known as ribonucleoprotein delivery (RNP). 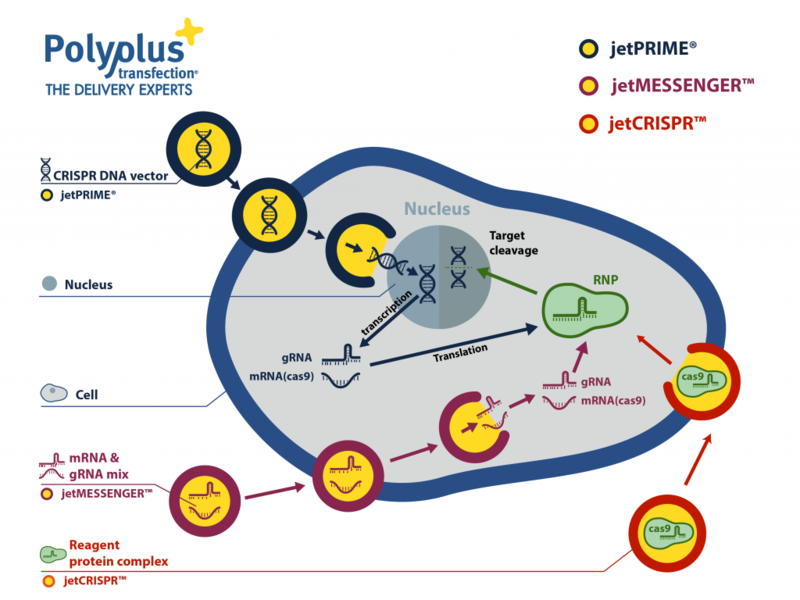 Both transcription and translation to obtain a functional Cas9 protein is completely bypassed, which makes RNP delivery using jetCRISPR™ the fastest, most efficient and precise gene editing approach currently available for a wide variety of cells. 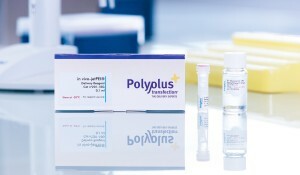 Specific conditions for many cell types can be found in our Cell Transfection Database or you may contact our delivery experts at support@polyplus-transfection.com for a tailored protocol for your experiments. For genome editing in vivo we recommend using in vivo-jetPEI® reagent as it leads to excellent delivery of nucleic acids to various organs in vivo using different delivery routes.